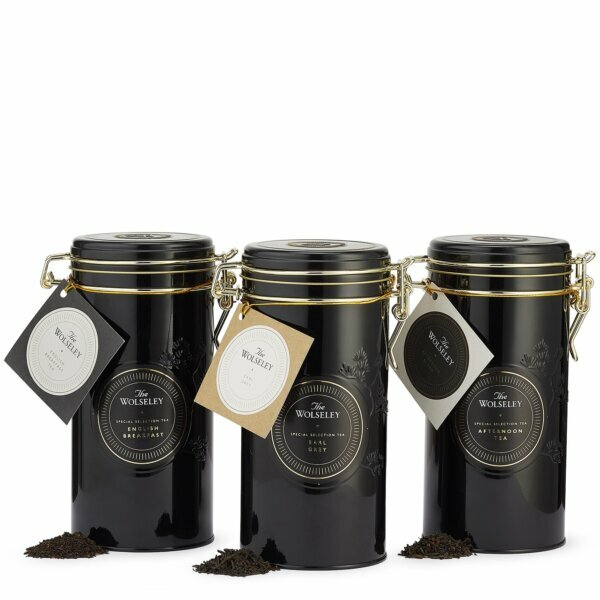 Three smart, re-usable black tea tins with gold detailing comprise some of The Wolseley’s most popular blends – invigorating English Breakfast, delicate Afternoon Blend and elegant Earl Grey. Our English Breakfast blend combines loose leaf black teas from Assam, Ceylon and Kenya; our Afternoon Blend infuses the champagne of teas – Darjeeling, with the floral sweetness of Formosa Oolong; and in our Earl Grey, China black is delicately infused with the citrus of natural Bergamot. All of The Wolseley teas adhere to classical and authentic blends; the tea leaves themselves sourced from ancient tea gardens around the world.